There are many reasons for fasting. In Western religions traditions, fasting has been used to purify the spirit or soul for thousands of years and is mentioned throughout both the Bible and the Quran. In the East fasting is commonly part of all major traditions and cultures. Fasting for health has also been around for thousands of years, with many cultures believing that fasting cleanses and detoxifies the body, preventing disease. Fasting has also been used to help cure many diseases, from cancer to addiction, and even help with weight loss. Juice fasting is a great, less difficult choice for many people. The basic idea behind all fasts is deceptively simple – you just don’t eat any food. But unfortunately, if you try that for more than a day or so, you will probably soon start feeling sick and be overcome with all your food cravings and addictions. That won’t help build your sense of confidence in a raw food lifestyle — so I recommend regular juice fasting! You see, you’ve probably been on the Standard American Diet (S.A.D.) for many years, or even decades. During all that time you have been eating cooked food, and absorbing all the toxins created by cooking, not to mention those from food processing. Many, of not most, of these toxins are not eliminated by the body, since eating that way damages the organs used for elimination. An immune system that is burnt our from a lifetime of toxins attacking the bloodstream every time you eat cannot adequately deal with toxins. A colon that is not functioning adequately cannot remove toxins. If you consume toxins faster than your body can eliminate them, they can end up staying in your body, buried in your cells, your tissues, your bones, even your brain. Then one day you have a revelation, or gain more weight than even you are willing to put up with, or get a chronic disease. Suddenly you realize that what you have been putting in your mouth all these years may not have been working for you! So you decide to go on a fast and just stop eating. Maybe you heard that you should drink a lot of water, so you do that. Good. Your body is thrilled at first. Now it can start eliminating these built-up toxins. But after your body starts dumping these toxins into your bloodstream, things won’t seem to be going as well. You see, you’ve inadvertently created a “healing crisis,” also called “too much of a good thing.” At first you feel awful, like having the flu. You may eventually feel even more discomfort, including back pain around your kidneys. And while this is going on you are constantly hungry. Here’s the problem – you have no way to get rid of all those toxins that your body has safely (relatively speaking) hidden away for all these years (usually in your fat cells). Suddenly all these toxins are just dumped unceremoniously right into your bloodstream — overwhelming your liver, kidneys and colon, the main organs of elimination. Your body and breath will even smell strange as your body tries to eliminate toxins through the other major organs of elimination, your skin and lungs. Now if you have a great deal of commitment and fortitude, you will survive this. But for some, the stress of the healing crisis could actually do more harm than good! Chronic Fatigue and related conditions are like that – they can get worse by you trying to get better without being sensitive or aware of what your body is going through. As a result, I rarely recommend a pure water fast for most people. It is unnecessarily harsh and could cause problems. Doing a pure water fast properly actually requires a bit of knowledge and support in order to do it properly. Instead, I recommend Juice Fasting! We should all have some compassion for ourselves – our poor body’s have been starved for real nurturing food for years while being stuffed with pesticides, preservatives, carcinogens, mutagens strange genetically modified DNA that nature never ever saw before and more. Besides, it is not necessary to do that to ourselves, except in certain rare lifesaving situations. Juice fasting provides many of the benefits of water fasting without most of these problems. A gentle, controlled juice fast doesn’t create a healing crisis, releasing toxins into the bloodstream more slowly and at a rate your body can handle more comfortably. This doesn’t mean it is easy. You will still come face to face with your cravings and addictions. However, it is probably something you can handle. If you’ve never fasted before, I recommend starting out with a 3-day juice fast. Actually, this is a 5-day program. On the first day eat nothing but raw fruits and veggies (avoid fruits if you have any sugar issues). For the next three days have simple juices for all your meals (green only if you have sugar issues). On the last day, eat a simple raw diet – just fruit and salads. This gives your body a chance to enter into a cleansing cycle gradually and gracefully, and then step out of the cleansing cycle gradually and safely as well. Don’t shock your body by breaking the fast too suddenly with a pizza as that can cause more harm than the good you did while juice fasting! As you gain confidence and experience, you can enjoy juice fasting for longer periods. I have done juice fasting for as long as 3 or 4 weeks. In fact, the longer you do it the easier it becomes! After a few days you don’t even feel hungry any more, since your body learns it is getting all the nutrition it needs! A lot of the hunger you used to experience was not hunger, but habit, combined with the fact that most of what you eat was not nutritious so you were slowly starving your body. But when your body isn’t backlogged with toxins and can start assimilating all the nutrition in the nutritionally dense juices with ease, all that begins to change – and if you are at least 80% raw and vegan, you’ll stay that way!. Juice fasting for 3 days is good for periodic cleansing. Longer juice fasts should only be done occasionally, depending on your overall health. I recommend that everyone use juice fasting at least one day a week as regular maintenance. Start the night before by eating dinner early, then nothing. When you go to sleep your fast will be well on its way and you can sleep through most of it! The next day have a juice for breakfast and lunch. Now you can break your fast with a simple raw dinner. A 24 hour juice fast is that simple! With all fasts, drink plenty of water throughout the day. If you are juice fasting longer than 3 days, I recommend using a 50/50 percent mixture of spring water and juice. The diluted juice is a little easier on the system. If you prefer, just drink a glass of water after you have a glass of juice, for the same result. For 3 day and longer fasts, it is also a good idea to get a colonic every few days. Colonic Hyrdrotherapists can usually be found in most places in America these days. I found an Ammonite lady doing them when I was fasting in an out of the way area of Pennsylvania once. If you can’t do that, then at least to your own enemas once a day to help your colon remove the toxins that normally are excreted by the colon. Once food stops moving through the colon, it needs help getting rid of the toxins that arrive at the colon walls waiting for a train that isn’t coming now. So help them out! Raw organic vegetables. I recommend to avoid fruits for this, too much sugar. If you have a known issue with sugar, then you should also avoid carrots and beets. Plenty of good water. I recommend bottled spring water from a company that uses food grade plastic or glass bottles. I like Fiji water myself. A low-RPM juicer, like the Samson Juicer or GreenStar Elite. This is essential. You will need all the nutrition you can get during the fast. Don’t waste any of it with the heat and oxidation you get using a centrifugal juicer! OK, any fresh juice that you can drink immediately is better than none, but I need to make the point that a good low RPM masticate juicer is far superior. Something to wash your vegetables with. I use a veggie wash from the health food store, and I soak my veggies in a sink of water with just a bit of bleach or hydrogen peroxide to disinfect them, too. Personally, I like to use an ozone generator to saturate the water with ozone, too, which kills any parasites that even organic produce may pick up along the way to your refrigerator from some South American fields. CARROT juice is very popular – Mostly because carrots have a lot of sugar in them! , Though carrot juice can be highly beneficial, i usually recommend that peopel avoid it when first starting out with raw food, especially if you even suspect that you may have any sugar-related problems like diabetes, cancer, candida, hypoglycemia, etc.. There is no need to peel carrots if you first clean & soak them well. 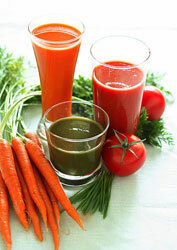 Carrot juice is very high in beta-carotene, a precursor for vitamin A. Remember, excess beta-carotene is stored in your skin until your body needs it – which can make you look orange, a harmless condition called “carotenosis.” Stop drinking carrot juice for awhile and it will go away. CELERY juice is very tasty, but a little high in sodium. I use it in my green juice, especially during short periods like a fast or cleanse.. Juice celery leaves and all for the most benefit. CUCUMBER juice is surprisingly tasty and refreshing and is the other main ingredient in my basic green juice for fasts and cleanses. There is no need to peel cucumbers if you wash and soak them. ROMAINE LETTUCE or BEAN SPROUTS make an especially nutritious juice, addin g lots of minerals and chlorophyll to a green drink. ZUCCHINI SQUASH tastes better than you may think. BEET juice is traditionally a blood builder. Beets must be peeled before juicing because their skins are very bitter. A quick dip in boiling water helps remove the skins – but don’t let them cook in there! Beets, even more than carrots, are very sweet and loaded with sugar. This makes them very popular at the typical commercial juice bar, but not always so good for you, especially if you have any of the sugar-related issues I mentioned above. I do not include beets, which are dark red and may even stain some juicers, in my green juice. CABBAGE juice was used by Dr. Garnett Cheney, M.D. to cure bleeding peptic ulcers in the 1950’s. (Cheney, G. (1952) “Vitamin U therapy of peptic ulcer.” California Medicine, 77:4, 248-252). Dr. Cheney’s patients used a quart of cabbage juice a day and were cured in less than half the usual time without drugs. Since then, cabbage juice has successfully been used for a variety of gastrointestinal illnesses, such as colitis, spastic colon, indigestion, chronic constipation, certain forms of rectal bleeding and more. More recently, the American Cancer Society has urged people to eat more veggies in the cabbage/broccoli family. TOMATOES are easily juiced, but do not juice the leaves, vines, or use green tomatoes. Only the red, ripened fruit is good for your juice. It is best to drink your juice immediately after making it. Chew your drinks and drink your solids — digestion starts in your mouth with your saliva. How to Enjoy a Safe, Raw 3-Day Juice Fast!